Although a huge space, which today turned into a cultural and densely populated country, were covered with virgin forests and impassable bogs, this fakt was not a significant obstacle. The extensive system of rivers, which ensured moviving on canoes and rafts at any time of the year, everywhere provide opportunity to develop a new space. Water was everywhere, and there was no arid land or desert here. The summer in Europe was not murderous heat and even winter here were not so severe to be an obstacle to residence [Krämer Walter. 1971, 22]. It should be emphasized that during the migrations of ancient peoples, not the entire population was leaving their ancestral home. In particular, as W. Porzig thought, this had no apparent reason for Indo-Europeans [PORZIG W., 1964: 97-98]. Most likely only surplus population moved away to new lands, and a pretty big part of it, especially in isolated areas should be retained. After coming new alien population, the remnants of the previous one was assimilated by them, but were influenced to some extent on the language of the new arrivals, ie, the effect the principle of superposition had place. Substrate effects on the example of individual languages are considered in the section Language Substratum. On the other hand, while migration, for different reasons, from time to time some part of people stayed permanently in convenient locations while the majority moved on. Thus, the movement of the peoples of those times was no resettlement in the full sense of the word. Correct to call it the scattering. Obviously it does not go without military conflicts, but cultural contacts aliens with autochthonous population were inevitably. In particular, close cultural exchange took place during settling Turks on Trypilla culture space when they are in search of free land began to move to the right bank of the Dnieper. Natural conditions, not only contributed to the migration of the population but also determined their direction. It is understood that the forest area hampered the resettlement of people and the most convenient way were river systems [GOLUBOVSKI P. 1884, 13]. Boating on rivers was realized by dugout canoes hollowed out tree trunks (see the photo of a a Slavic dugout boat from the 10th century at left). In the steppe zone, where rivers flow more in the direction of the meridian, the need for resettlement pushed people to seek other means of transportation. So inhabited steppe Turks came to the invention of the wheel. Turkic languages have common word čana “sled”. The Turks were the first who domesticated the horse and used it as draft animals to transport things it on sleds. Since sleds are ineffective at summer, the Turks made their resettlement probably at winter, until invented the wheel. Invention of turning movement (rollers and similar) and use it for transportation occurred at differrent peoples at different times [ZVORYKIN A.A. a.o. 1962, 55]. Idea of using the wheel was emerged also among the creators of the Pit culture regardless of external cultural influences (NOVOZHENOV V.A. 123 2012). Disc-wheels founded in the tombs evidence using by the Turks wheeled transport. Wooden carts of Pit culture time. 1. – Novotytarovskaya (Dinsk district of Krasnodar Krai). 2. – Ostanniy burial mound. 3. – Chernyshevskiy burial mound (Steppe Kuban'). Obviously the wheel and the cart were a further improvement of the roller. Therefore the first wagons were too heavy-handed, as the wheels rotated with the same speed, being firmly planted on the axis which turned together with the wheels. Such primitive carts could move only along a straight road for a small distance. However, with time axis and wheels were separated. The wheels were set on a fixed axle, which gave them the opportunity to rotate independently of each other at different speeds. At left: Reconstruction of the wagon of Novotitarovskaya culture. The reconstruction was made on materials from burials 150 and 160 of the I mound of Ostanniy remains (GEY A.N. 1991: 64). 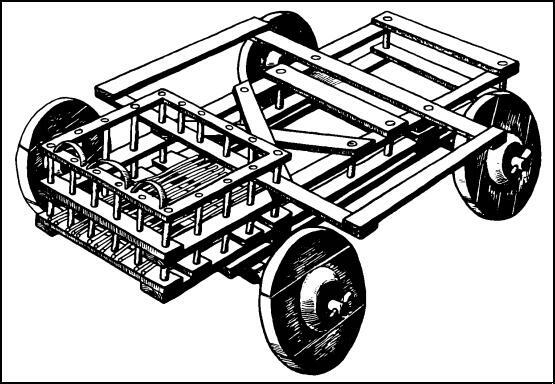 As you can see at left the wagon of this type has a complicated design with standard dimensions of parts. Tripartite wheel with 7 cm thickness and a diameter of about 70 cm had the hubs on both sides. Axis quadrangular section were built into the frame and the wheels with round ends were fixed on them by cotter and rotated freely. The method of fixation of axes exclude the presence of a rotator, ie the wagon could not provide a sharp turn. Draft animals (bulls or oxen) harnessed on both sides of the drawbar with a forked end that was fastened to the frame (ibid, 64-65). This design has made it possible to travel long distances. During this movement in different directions, different versions of the Corded Ware culture (CWC) were developed in Europe on the basis of the Pit culture influenced by local conditions and Asian culture of different type. The difference in the types of cultures can be explained by time difference between the beginning of the migration. Eastern Europe was settled by Turks in multiple streams bypassing settlements of Indo-European and Finno-Ugric peoples (see map at left). Only a part of the Turks inhabitimg the left bank of it moved westward, crossing the Dnieper River. They were the language ancestors of the Bulgars, modern Turkmen, Turks, Gagauzians, whose areas were determined by graphical-analytical method on the left bank. From the steppes, this part of the Turks moved further along the left bank of the Dniester and the northern spurs of the Carpathians, leaving their settlements in the Right-bank Ukraine and Eastern Poland. Their languages preserved archaic features of the Proto-Turkic language for a long time, because they lost contact with the rest of the Turkic languages, which continued to develop in close contact with each other in the old places. Most of the migrants to Central Europe and the Baltics were eventually assimilated among Paleo-European aborigines and later among Indo-Europeans, but due to historical circumstances, one of the descendants of the Bulgars, namely the Chuvash, retained their ethnic identity and, along with it, the archaic of the Proto-Turkic language. Thanks to this, the material of the Chuvash language helps us to track the paths of the Turks' wandering in a very wide space. For lack of sufficient pasture in a wooded area, the migrants had to keep moving on. Thus populating the territory of Germany and the Baltic states, after a while the Turks were moving also to South Scandinavia through the Jutland Peninsula and Finland (see the section Proto-Bulgarish Place Names in Central and Northern Europe ). A small part of the Turks moving along the banks of the Desna River reached the space between the Volga and the Oka and populated it partially forcing out and partially assimilating previous population. Here they created Fatyanovo culture as one of the variants of CWC. Another embodiment of this culture so called Balanovo was established by that part of the Turks, who crossing the Don River, moved along the right bank of the Volga to the mouth of the Oka River. Turks Migration towards the upper Volga resulted motion of a significant part of the local Finno-Ugric population (see the section "The Expansion of the Finno-Ugric Peoples"). At the same time some groups of Turks moved on land towards the Balkans. As Elena Kuz'mina pointed out, gradual infiltration Pit tribes from the steppe zone to the area of the ancient agricultural cultures in Moldova, Romania, Hungary occurred in the III mill. BC [KUZ'MINA E.E., 1986: 186]. Moving upstream of the Danube along its right bamk, the Turks reached the mouth of the Tisza River and then turned north. 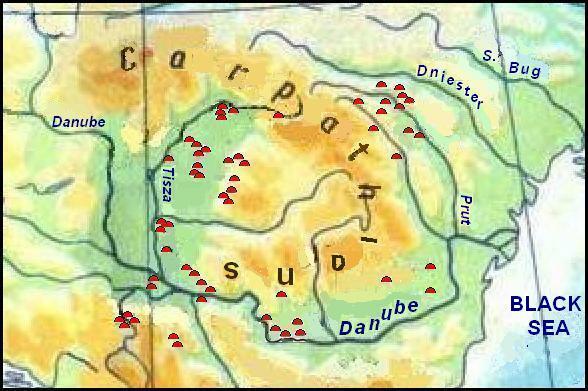 They gradually colonized the left bank of the Tisza basin up to the Carpathians, that is the area of Cucuteni-Trypilla culture. Wetland between the Danube and Tisza remained uninhabited. Small groups of Turks settled on the right bank of the Danube. Considering the Turkic ethnicity of the bearers of Pit culture, the meaning of this quotation has rightly to be attributed to the Turks. In addition, it contains a significant error. The settlement of Indo-Europeans in Europe is associated with the spread of CWC, which developed on the basis of Pit culture. But the sites of CWC are not fixed in the Balkans. 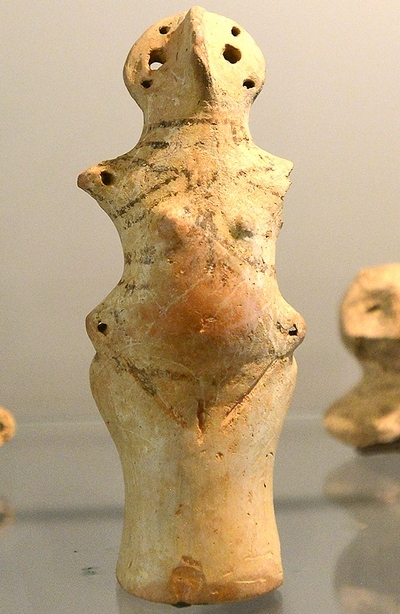 Many researchers believe that the genetic roots of Cucuteni-Trypilla culture are hidden in the cultures of the Balkans, the lower Danube and the Carpathian Basin, but not in the Neolithic of the Bug-Dniester basin; its ethnicity is considered to be unknown (ZBENOVYCH V.G., 1989: 172; Arkheologiya Ukrainskoy SSR. Tom 1. Pervobytnaya arkheologiya, 1985, K: 202-203). We hypothesized that the Trypillians could be Semitic people, and it is quite possible, if their ancestors came to the Balkans from Asia Minor. There are some vague connection of the Balkan and Asia Minor cultures. If the Trypillians, indeed, were Semites, then traces of their influence in the Turkic language have to be left, because they were neighbors of the Turks. The Dnepr could not be an insurmountable obstacle, especially in the winter, so the primitive trade and cultural exchanges between the Turks and Trypillians might take place. Let us look first the traces of Trypillian influences in the area of trade, ie among the words that mean "commodity", "payment" and of that kind. A large nest of words having different options based on the root tavar was already been considered in the section “The Language Contacts between Indo-Europeans, Turks, and Finno-Ugrians in Eastern Europe”. Similar words were found in the Hebrew: toar "a product", davar "a word", "a thing", "something". Analogous Trypillian word could accept the sense "goods" in the exchange process. Another hypothetical Tripoli word *kemel could mean "payment, indemnity" (Hebrew gemel "to pay back"). The similar word kěměl is present in the Chuvash language and means "silver". In full compliance with the phonology, it corresponds to the word kümüš of the same sense in other Turkic languages. Of course, the silver could fulfill the function of money at those ancient times, and change of the sense of the word occurred from the fact that the trading parties do without an interpreter and, therefore the same object could become different senses. That was just a payment for somebody was silver for another. Further searches yielded enough material, which gives reason to consider seriously the Semitic origin of the Trypillians. This is detailed in the section "Hypotheses". Along with the cult of the mothers, the Trypillians had the cult of bull as masculinity, and both cults were somehow intertwined [ZBENOVYCH V.G., 1989: 165]. It is believed that the image of a bull and phallic saints as a symbol of male power have been brought by Pit people, as well as the patriarchal clan system, the cult of ancestors and the funeral rites were brought by them [ALEKSEYEVA I.L. 1991: 20-21]. It is possible that since the beginning of the late stage of the Trypillian culture (3000 – 2400 years BC) Indo-European tribes began gradually to settle among the ethnic Trypillians having already before embraced the elements of this culture when it was spread to the Ros’ River and the middle Dnieper during the middle of its existence in 3600 – 3000 years BC (Arkheologiya Ukrainskoy SSR. Tom 1. Pervobytnaya arkheologiya. 1985: 211). Thus, the spread of culture came from the south-west to north-east, but no invasion of the agricultural population from Trypillian culture was not noted by archaeologists [KUZ'MINA E.E., 1986: 186]. However, as the steppes were dominated by the Turks, the Indo-Europeans in search of free land were forced to move on, choosing the direction agreed upon the arrangement of the previous places of settlement. It is likely that when moving were used waterways. By the time the Dnieper rapids were covered with water and do not interfere with boating, as Herodotus did noted nothing about cataracts. In particular, Greeks went a considerable part of their way by the Dnieper River. While this moving they established settlements that still exist till now (Kiev, Halep, Trakhtemyriv, Sahunivka). Finding comfortable place to settle in the valleys of the left tributaries of the Dnieper River, part of the Greeks ceased further movement and settled here, starting the settlements of Khorol, Poltava, Takhtaulovo and others. Later, they had a great influence on the development of Timber-grave culture here (more detailed see the section Ancient Greeks in Ukraine ). Meanwhile, most of the Greeks continued to sail to the mouth of the Dnieper. Having gained experience in the construction of boats and navigation, they continued their movement along the shores of the Black Sea. The sea is called the word ποντοσ by Greks, this word is akin to the Slavic put' "a way". Further the skills of navigation promoted them occupation of the Aegean islands. Having reached the mouth of the Danube, the Greeks came upstream to the Iron Gates, which made further navigation impossible, so further they moved to the Peloponnese by land, inhabited before by tribes, apparently related to the Minor Asian. In any case, the most ancient place names of Greece reveal features that are not native to Indo-European languages. Peloponnese and Aegean were settled by Greeks in several waves. The first wave were later Achaeans, Ionians and Aeolians come from the Balkans and reached the Aegean islands near 1900 BC. Conquerors ruined settlements of previous inhabitants, which were called by them Pelasgians, Carians or Leleges. The dark memories of the mysterious Pelasgians tribe were survived at Greeks till the classical time. This invasion gave start of the Middle Greek epoch, which was fusion of local cultural traditions with the new Indo-European elements. This era continued more as three centuries, and Mycenaean period (1600 – 1050 BC) occurred at the end of this cultural synthesis. In the XIV-XIII centuries BC Achaeans began their expansion in Asia Minor, Egypt, Sicily and the south of the Apennine Peninsula. According Egyptian sources this expansion could be connected with the invasion of "Sea Peoples". The attack of the Greeks against Troy happened by this time too. 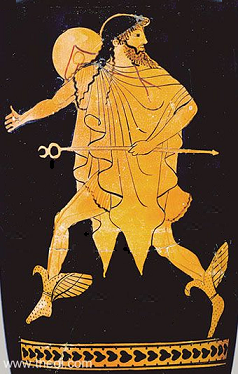 Shortly after the end of the Trojan War, about 1200 BC according to archaeological data, the Greek mainland was suffered of some destructive phenomena that is connected with a new invasion of the Greek tribes of Dorians, more primitive relatives of the Achaeans, also come from the north. The second stream of Indo-European expansion was held by dry land south-westward to the shores of the Adriatic. Great changes in the composition of the population of Transdanubia and Alfeld occurred at the turn of the Bronze and Early Iron age [SHUSHARIN V.P. 1971: 15]. There is reason to associate these changes with coming here Italics and Illyrians. The latest stayed in Saxony, Moravia, Bohemia, where their traces can be found in place names [POKORNY JULIUS, 1936: 193], then they settled the north-west part of the Balkan peninsula, and later populated Epirus and possibly more extensive land in Greece [HOFFMANN O., SCHERER A., 1969: 10]. But Italic tribes (Falisci, Osci, Umbri Sabines, Latins at al.) moved as the first because they progressed in their travels further to the Apennine peninsula. The settling of the peninsula occurred in several waves because Sabines and Latins, stayed in Pannonia for a long time. 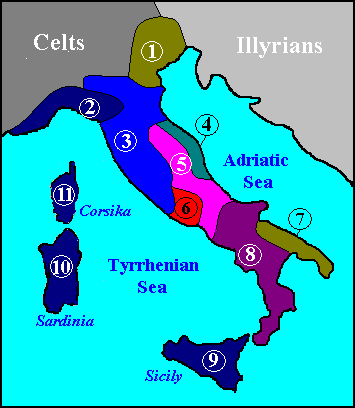 At right: The people of Italy at the beginning of I millennium BC. All this movement of Indo-European tribes southward could continue for several centuries, because the Phrygians and Armenians were joined in the general process of relocation later. The fact that the Phrygians penetrated in Asia Minor via Balkans was confirmed in Greek legends. The Phrygians and mysterious Mushki came to the shores of the Sea of Marmara about the same time with the Dorians [BARTONÉK ANTONÍN. 1976: 60-65]. These Mushki could be a tribe allied to Phrygians, or one of their tribes, it could also be another name of Phrygians, but that the Mushki moved to the headwaters of the Tigris later and settled there, lets suppose that these were the ancestors of modern Armenians. However, E. Tumanyan, referring to the Hittite and Assyrian-Babylonian sources, claims that the ancestors of the Armenians together with the "sea peoples" have appeared in the Chalis valley in the middle of the II millennium BC [TUMANIAN E.G. 1971]. Their nearness to the Phrygians was already discussed in the section The Areas of the Uprising of the Tocharian, Albanian, Thracian, Phrygian Languages. Since the Phrygians and Proto-Armenians appeared in Asia Minor in the middle (or end) of the II millennium BC, up to that time (not counting the time of the relocation) they had to populate the right bank of the Dnieper River as they stayed for some time in the Indo-European language space, to south of the Thracians. Toch. menki "smaller" – Osset. mingi "small, a little". Mansi śiś "child" – OInd. śiśu- "child". Mord. saras "hen" – OInd. śāras "motley" [KAMBOLOV T.T. 2006: 32]. Thanks to the works of O. Trubachev, hundreds of ancient linguistic forms were etymologized, and three extensive areas of Indo-Aryan linguistic relics were discovered in the Northern Pontic Region: Sindi-Meotian (Sea of Azov), Tauri-Scythian (Great Scythia) and Singane-Getic (Scythia Minor). The vast majority of Meotian linguistic relics is comparable with language materials of Indo-Dard-Kafir group of Indo-European family. Already described and studied earlier language material is sufficient to conclude about genetic kinship of the Sindo-Meotian and Indian [SHAPOSHNIKOV A.K. 2005: 32]. The area of these names coincide with the areal of Hurrian language (from the foothills of Iran to Palestine) [DIAKONOV I.M., 1968: 29]. From the Diakonov's arguments about the mass application of fight chariots by the speakers of this language, they came from the regions "north of the Caucasus" [Ibid: 30). Here it is necessary to say that the problem of migration of ancient Indo-Aryans is entangled by the generally accepted idea of ​​the existence of a special Indo-Iranian (Aryan) language community. According to Harmatta, the advancement of the "Indo-Iranian" peoples from the steppes of Eastern Europe to Asia up to Hindustan and China occurred in two waves. The first wave took place with the beginning of the II mill. BC, and the second did with the beginning of the 1st mill. BC. [HARMATTA J., 1981: 75]. According to our view, only the Iranian tribes should be considered with the second wave, and the first wave should follow the Turks that moved to Central Asia (see below). The left areas of the Indo-Aryans, the Thracians (Proto-Albanians), Phrygians and Armenians were occupied by the Iranians (see the map at right). Baltic people occupied the area of Tocharians after they departed away. 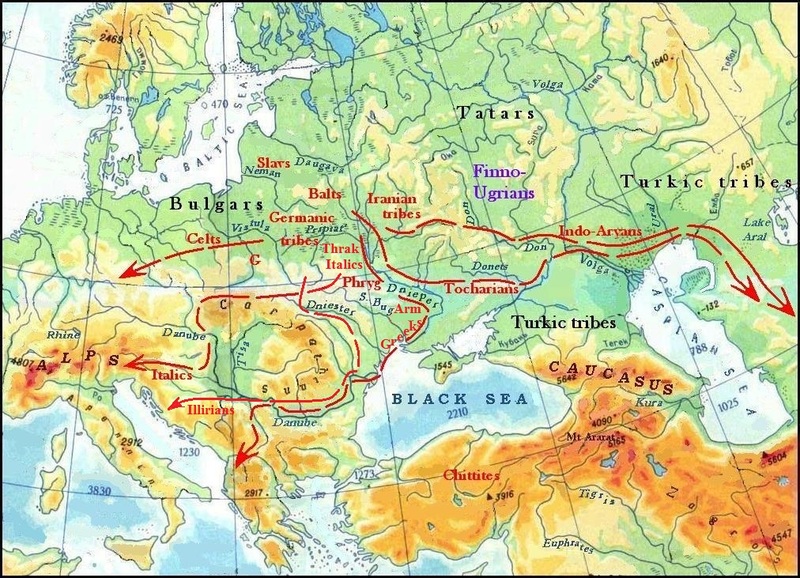 Following the Phrygians, the Thracians crossed the Dnieper and settled for a long time on the Right Bank Ukraine, and from here, in the Pre-Scythian period advanced to the Balkans. The Celts, perhaps under pressure of the Germanic tribes began moving to the west, where they were the creators of Central European cultures of Urnfield group (1300-750 BC), the north-eastern boundary of which seem to pass along the Neman, beyond of which the Slavic land lay. Germanic people have spread into the area of the Celts, occupied Greek area and southern areas of the Italics and Illyrians. During these migrations the Slavs also expanded their territory to the Baltic Sea, moving on the right bank of the Neman and thus established a direct language contact with the Celts. A. Shakhmatov gives a significant list of alleged lexical borrowings in the Slavic language from Celtic, where a prominent place belongs to the public, military and economic terms. The researcher also suggested that part of Germanisms entered the Slavic language by means of the Celts. Close Celtic-Slavic relationship facilitated conveying the ethnonym "Wends" on the Slavs [SEDOV V.V. 1983: 83]. V. Sedov, also noted that a number of authentic Celtic-Slavic lexical similarities were pointed out by J. Pokorny and H. Pedersen showed some grammatical parallels between Old Irish and Slavic languages. T. Gamkrelidze and V. Ivanov gave the examples of Celtic loanwords in Slavic: *sluga, *braga, *ljutь, *gunja, *dǫgъ, *tĕsto (GAMKRELIDZE T.V., IVANOV V.V. 1984). The result of Celtic-Slavic contacts in phonetics was nasalization of vowels in Slavic languages, which developed in line with the whole process of monophthongization of Slavc diphthongs *en, *em, *on, *om and so at the tendency of increasing sonority in syllable structure, which led to the law of the rule of open syllable (VINOGRADOV V.A., 1982: 303; KHABURGAYEV G.A., 1986: 94). As nasal vowels already existed in the Celtic, under its influence the monophthongization in this case went in the direction of the nasalization of diphthongs in closed syllables. This effect may be explained by dwelling the Celts and Slavs in the same phonetic area. According to S. Bernstein, T. Lehr-Spławinsky tried to explain the origin of the Masurian dialect by the Celtic influence. S. Bernstein himself also believed that "the Celtic influence on the Proto-Slavic language was deeper than it seemed so far" (BERNTSTEIN S.B., 1961: 95). V.V. Sedov believed that intensive Slavic-Celtic interaction took place with the reverse migration of the Celts from west to east, which began about 400 BC. Being the creators of the La Tène culture, they made a great contribution to European culture, in particular, to the development of metallurgy and metalworking (SEDOV V.V. 2003: 4-5). Traces of this influence are noticeable in the Przeworsk culture, which creators considered by V. Sedov to be the Slavs, but in fact they were Germans, and Celtic influence on culture and especially on metallurgy of the Slavs is not visible at all. This is understandable – at that time Slavic-Celtic contacts could not be, they took place at a much earlier time, even before entering the Goths to the basin the Vistula, separating the Slavs from the Celts forever. Ancestral home of the Goths was in the area between the upper reaches of the Pripyat and Neman Rivers from the Yaselda till the Sluch River, where they remained until the beginning of the I mill. BC. After that, they began to move westerward on land of the Slavs extended to the Vistula. Only in few centuries a new wave of Slavic migrants forsed the Goths to leave the land and move along the right bank of the Vistula to the Volyn and further to the Black Sea steppes (see. the map below). 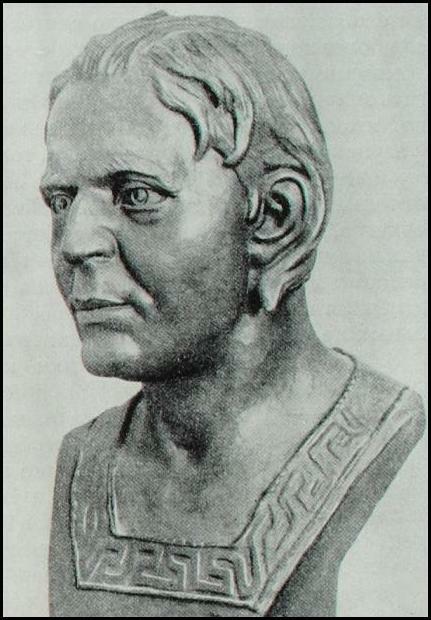 Wielbark culture at late Roman times [BIRBRAUER F. 1995, 37. Fig. 6, according: KOKOWSKI. Problematyka kultury wielbarskiej w młodszym okresie rzymskim]. The homelands of the Goths (the number I) and the Slavs (the number II] are marked additionally on the original map. … beginning at the source of the Vistula, the populous race of the Venethi dwell, occupying a great expanse of land. Though their names are now dispersed amid various clans and places, yet they are chiefly called Sclaveni and Antes. (JORDANES. 1960. III. 35). In comparison with the migration of Indo-Europeans, the Turkic expansion in the wide Eurasian space lasted much longer and covered the Pit and Catacomb periods. The remains of wooden carts and clay models of wheels, trolleys and tent-carts were found on the territory of Ukraine and the North Caucasus in about 250 graves of the Pit and Catacomb time (KULBAKA V., KACHUR V. 2000: 27). 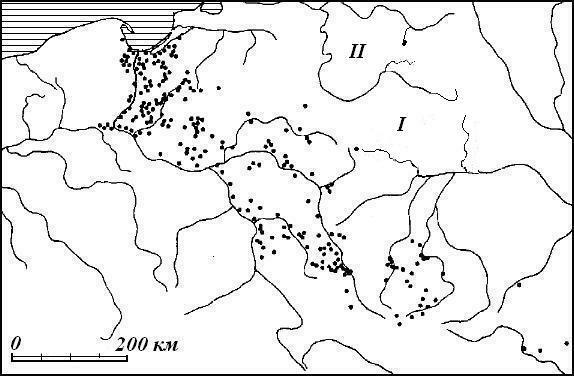 At the same time, research shows that during the Catacomb period, the number of carts and model finds on the Right-bank Ukraine and the Kuban has decreased significantly, but it has increased in the Kuma-Manych lowland whay may indicate the termination of migration to Central Europe and an increase in the outflow of population in the eastern direction (see the map below and compare with the map 32-30 above). Burials with characteristic cart attributes in the Don-Volga forest-steppe indicate that the second wave of Turks also followed the same path that the Fatyanovs and Balanovo residents had previously gone through. On the territory of the Upper and Middle Volga region from the upper Oka to the Urals, in the second millennium BC. they became the creators of a new culture, which was called Abashevskaya. Archaeological finds, in particular non-Abashevskaya type clayware in the cultural complexes of that time, are evidences that only military detachments moved though this territory from the south, and "there no inter-assimilation of full-fledged cultures took place, but rather a replenishment of the deficit of own "one-cultural" women by local ones" (MATVEEV Ju. P. 2005: 11). However the main mass of Turkic people moved in search of new pastures behind the Volga in the steppes of Kazakhstan, and another part of them settled Ciscaucasia, displacing the population of Maykop culture, which should also move to the left bank of the Volga and move further to the east. At right: Settling of ancient Turks in Ciscaucasia. The present population of the North Caucasus is multinational, but among it there are Turkic peoples of Kumyks, Balkars, Karachais and Nogais. But only the Nogais have clear Mongoloid traits, while the other Caucasian Turkic people, just like the Turks, Azerbaijanis, Turkmens, Gagauzes present the Europoid type. Mongoloid signs clearly make themselves felt at the slightest cross-breeding, so there is great doubt that the ancestors of these peoples once were in the territory where the main population belonged to the Mongoloid race. According to the location of the areas of formation of the Turkic languages, the ancestors of the Caucasoid Turks had the ancestral homeland of the Seversky Donets and the Dnieper Rivers. And the language ancestors of the Yakuts, Kirghiz, Kazakhs, Khakas, Tuvans lived at the same time between the Seversky Donets and Don Rivers. That's it they had to move across the Volga to the east. There are three main categories of lexical matches: elements borrowed from Ossetian into Balkar-Karachai, elements acquired from Balkar-Karachai into Ossetian, and elements adopted by those and others from the common local Japhetic substratum (KAMBOLOV T.T. 2006: 277). Kambolov points out that determination of the direction of borrowing is possible using morphological, etymological, phonetic, and other criteria, but does not propose a criterion for the stratigraphy of matches. M. Dzhurtubaev does this sharply polemicizing with V.I. Abaev. He analyzes a huge amount of data on the mutual linguistic borrowings of the North Caucasian peoples and, in particular, on borrowings in the Ossetian language from the Turkic and other languages. He proves, by using numbers and facts, that Karachais and Balkars lived in the Caucasus long before the Ossetians came here (DZHURTUBAYEV M. 2010: 265-413). There is no possibility to stay on his arguments, it's a separate issue, but it should be pointed out that Dhurtubayev was wrong, believing that the Ossetians came to the Caucasus not from the Great Steppe, but from the Transcaucasus. Just like the Turks, they came from the steppes, but one and a half thousand years later. Similarly, the Balkars and Karachais were pushed back to mountainous areas by the Kabardians and Circassians but the Kumyks continue to live in the plain, although at some time they too advanced to the valleys of Dagestan. This has been evidenced by the names of the Sulak and other rivers which have the Turkic component of Koisu. Having settled in close proximity with peoples of different origins, the Turks not only adopted the customs and lifestyle of the local population but also enriched the common cultural fund of the peoples of the Caucasus. For example, a wide custom of "milk brotherhood", based on the transfer for a time of a newborn child to another family originated from them. This custom is called emgek, emchek, but the same words can mean "milk-brother", "foster-brother". That the custom is of Turkic origin proves its name, which is based on the word that in the Turkic languages ​​means "mother's breast" (Kum. ämcäk, Karach., Balk emček). As for the Eastern Eurasian component in the studied populations, it was represented by about the same degree according to how mtDNA and Y-chromosome. In addition, Turkic-speaking Karachai don't demonstrate a substantial portion of this component that is especially true for mtDNA. 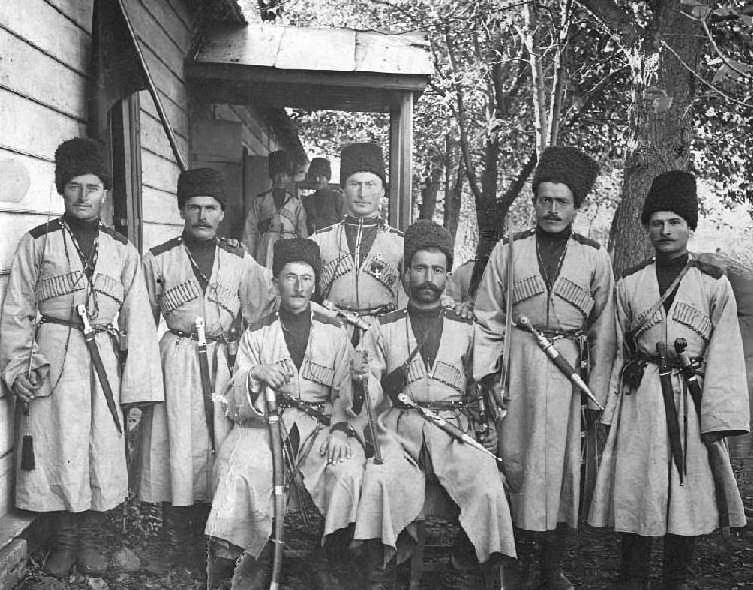 Moreover, some populations of Abkhaz-Circassians contain it to a greater extent. Data on the Y-chromosome, generally confirm this result…(LITVINOV SERGEY SERGEEVICH, 2010, 20). At left: Balkars (Karachais?). Photo from the site "Forgotten history." As you can see on the photo at left, the Balkars and Karachais have no Mongoloid features. It is believed that the ancestors of these people were the Cumans, which allegedly came from behind the Volga River into the Black Sea steppes in the early 11th century forcing out the Pechenegs from there. However we have no historical evidences supporting this assumption, though the invasion of a numerous people into the neighboring country could not be missed in ancienr Russian and Byzantine sources. The Tale of Past Years first noted of the Cumans under 1055 year and it seems quite casually: "In the same year came Bolush with the Cumans and Vsevolod made peace with them, and the Cumans returned back where you came from." There is nothing new about the presence of the Cumans in the immediate vicinity for the chronicler's. In the archeology of South Siberia and Central Asia, Afanaiev's culture has long and rightly holds a special place for a number of reasons. The most significant of them are the fundamental cultural transformations, which for the first time take place at this period on the indicated territory. The key components of the "Afanasiev phenomenon" were formulated by M.P. Gryaznov… This is a transition to the cattle-breeding type of economy, the beginning of the metallurgy of copper, a number of indirect data that testify to the process of the emergence of a complex system of social relations, involving the emergence of social stratification, special ideological ideas and other innovations that point to a completely new, recognizable matrix, which will finally form in the steppe world a little later (FRIBUS A.V., 2012: 199). A number of features that can be considered as ethnocultural, point to regions where the Proto-Afanasiev complex could form – these are the territories of the Lower Dnieper and the steppe Crimea up to the Azov Sea and Ciscaucasia. Only here are the analogies of the Afanasyev funeral rite, in particular, specific funerary structures. As for the rest elements of funeral practice, the whole set of attributes in the most general form would be more accurately compared with the early common Pit standard, which was an integrating element at the early stage of the forming of the ancient historical cultural area (FRIBUS A.V., 2012: 200). Thus, there are data that allow us to assume that Afanasiev culture was created by the Turks who came from the steppes of the Black Sea Northern shore and the Azov Sea. The chronological framework for the migration of Turks to Altai is difficult to establish. The similarity of the Afanasiev and Pit sites allows us to consider them synchronous, but there is a distance of several thousand kilometers between them, so a chronological shift is inevitable. On the other hand, the determination of the age of the Pit Cultural-Historical Community was calculated using the radiocarbon method, so there is no other way to use the same method to determine the age of Athanasiev culture. According to the calculations, the upper limit of the range of radiocarbon dates of funerary graves in the Middle Yenisei and Altai coincides with an accuracy of one year (2289 and 2290 BC). Altaic dates are evenly distributed over 1500 years, which clearly contradicts the number of left sites, and in the Middle Altai are on a chronological segment of 700 years (3200-2500 BC). The question why the Afanasiev sites could appear in the Altai earlier than in the Middle Yenisei is to be considered open (POLAKOV A.V. 2010: 161). 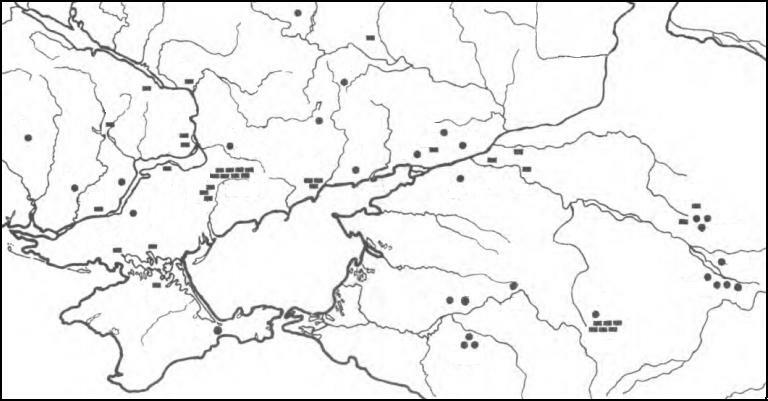 However, while agreeing that the creators of the Afanasiev culture came from the west, as evidenced, among other things, by the dissemination of wheeled vehicles (see the map below), one must agree that Afanasiev sites in the Middle Yenisei could not have appeared earlier than on Altai. Spreading the cart transport in Ural-Kazakhstan Steps. Turkic tribes that have crossed the Volga began to settle on the territory of modern Kazakhstan and further to the east, following the order formed by location of the settlement sites on the Urheimat. The Yakuts, having populated the extreme eastern area of the whole Turkic territory, so moved as the first northerner of Lake Balkhash in the direction of Lake Baikal. Subsequently, they went up the Lena River to places of their present habitat. Following them, came the ancestors of Tuva people, which we conventionally call Tuba. They reached the headwaters of the Yenisei and are living there now. The ancestors of their modern neighbors in the Altai Mountains were also neighbors on the Urheimat. The Khakasses, Kamasins, Shorts, Chulym Tatars are residing northerner of them now. They all speak closely related languages derived from a patern language, which we conventionally call Khakas, which area occupied the northern part of Turkish territory on the Urheimat. Obviously, they have moved as more northerly flow, and behind them moved their southern neighbors Kirghiz. Certain time they had to occupy neighboring territories in Siberia, but later the Kyrgyz moved to Central Asia, where they are living now. In order of priority, the common ancestors of modern Kazakhs and Nogai moved after the Kyrgyz. The Kazakhs gradually colonized the large area from the Lower Volga to the Altai Mountains and the Nogai have recently returned to Europe. The last of the Turks, who crossed the Volga, moved ancestors of modern Uzbeks and Uighurs, which we call generalized Qarluqs (see map below). The moving of steppe tribes to the borders of Central Asia is evidenced by an open in the Low Zeravshan River burial place of Zamanbaba and other relics united now in a Zamanbaba culture” (MASSON V.M., MERPERT N.Ya., 1982: 329). Presumably moving of Turks southward to Afghanistan has been stopped by numerous local population. Fortified settlements in Margiana with traces of fire and found there pottery of steppe appearance can confirm this assumption. Obviously after the first meetings with the militant nomads local farmers began to build fortifications to protect their settlements and temples. The first appearance of regular fortresses in the south of Central Asia dates back abroad III – II mill. BC. (SHCHETENKO A.Ya. 2005, 124-131). This time corresponds exactly to the continued migration of Turks in the steppes of Kazakhstan and Central Asia. Caucasoid in their morphological features population was in vast majority of the people of the Altai-Sayan highlands in the Chalcolithic and Bronze Ages, partly in the early Iron Age. Mongoloid admixture is fixed at this time only in isolated cases, but has steadily increased since the Early Iron Age reaching the full superiority at modern time (ALEKSEYEV V.P. 1989: 417). Morphological similarity of a portion of Caucasoid skulls of the Andronov series from the burial place Preobrazhenka-3 with series of Bronze Age steppe cultures suggests the possibility of the migration of population from the western regions of the Andronov culture, which physical appearance manifested Mediterranean racial type (MOLODIN V.I., CHIKISHEVA T.A. 1988: 204). At right: A man from Bronze Age. Kazakhstan and Southern Siberia. Andronovo culture. The reconstruction of M.M. Gerasimov. (Vsemirnaya istoriya v 12 tomakh. 1955. V. 1, p. 457). The origin of the Andronov community is one of the central issues in the history of Indo-European peoples. Indo-Iranian or Iranian ethnicity of this community is proved definitively (KOZINTSEV A.G., 2009, 126). In 1960, archeologist S.S. Chernikov published in Moscow an interesting book "East Kazakhstan in the Bronze Age", in which, based on the archaeological material he had extracted, he expressed "seditious" thoughts: carriers of Andronovo culture, which were considered Iranian-speaking, were rightly called by him as the ancestors of the Turkic peoples. Some archeologists, captured by the idea of the Iranian-speaking Andronovites, immediately attacked S.S. Chernikov with harsh criticism. (LAYPANOV K.T., MIZIEV I.M. 2010: 6). The question arises to the staunch supporters of this view: How could it happen that a large mass of Indo-Europeans was completely disappeared from the face of the earth, even without leaving visible traces in the languages of the local population? Even if they were gradually dissolved therein, then, as experience of the Tochars shows, then it should have gone for hundreds of years. During this time, immigrants from Europe had to assimilate at least a part of the local population and to impose their own language, since they were the bearers of a higher culture than the inhabitants of Siberia. That's what we just see that if the migrants will be recognized as the Turks. During the subsequent cross-breeding of the Turks with local population as a result of co-existence together, an uniform anthropological type was arisen with obvious Mongoloid features of many ethnic groups, either kept their Turkic (Yakuts, Tuva, Khakas, Kyrgyz, Kazakhs, etc. ), or Mongolic language. Anything definite about the migrations of the ancestors of the Bashkirs, Uzbeks and other people's is hard to say because their Mongoloid element is expressed enough clear. What places and at what time were been settled by these people, remains to be seen.